As I write this, I speak to You directly – because I know there is nothing standing between our minds, and there is nothing standing between our hearts. ESCAPE TRIPTYCH is a set of three paintings, completed in 2013, 213x152cm each (7’x5’). They are named Classical Escape, Renaissance Escape and Cubist Escape respectively. Together they depict a journey through life driven by desire for self accomplishment – from struggling to make first steps in humble beginnings; through climbing the social ladder and reaching for life’s dreams; and ultimately achieving the dreams and defining oneself as a mature individual. More importantly, these paintings depict the feeling that life is a struggle. It is brutal and it is different kind of strugle in every stage. But life is also beautiful. It is magnificent. So I painted these painting never to forget that – I panted them so I could bear life as it is. And ultimately, I wanted to remember that only through personal sacrifice and effort can we go forward and develop as human beings. The idea for Escape Triptych comes from my personal experiences, as my professional journey has taken me from my home country of Serbia, through Britain, and towards California. Exploring the world and building a successful career in the field of design, graphics and animation – all the way to big movie productions in Hollywood. More intimately, my travels through Mediterranean, one of the cradles of civilization, have shaped my love for human figure and anatomy, and my artistic style in general. The term Triptych originates from artwork that consists of three separate pieces which complete a story – first found on windows of gothic cathedrals. These large windows required support columns in the middle, so architects would often put two columns – splitting the window into three parts. In these sections they would put three stained glass images, which were related to form a unified story within a single window. The term Escape is used figuratively to evoke feeling of struggle, desire to break away from current state into something better. This is the driving force both in the life of an individual, and on the level of society and civilization as a whole. With these thoughts in mind, the story has two dimensions – individual and historic. 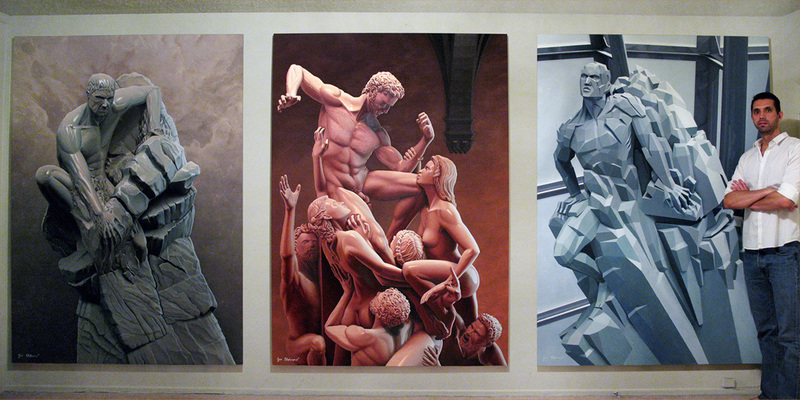 CLASSICAL ESCAPE is the first painting in Escape Triptych. It presents the desire, early on in life, to dream big and break free from surroundings that are limiting. If you come from small town, or small country, you understands this. Or if you had to work your way through college, or you have had a rough situation early on which has affected you. It is a feeling of climbing the walls of the dark pit to reach the surface. For me, this was the time of growing up in Serbia, part of Former Yugoslavia, during the times of civil war and hard economy, after the country split apart. I started working at very young age, doing small time marketing material, and realized that with my own hard work I could build a better future for myself. Classical Escape was inspired by ancient Greek and Roman sculptures, which I have encountered during my travels through Mediterranean. Extrapolated to the level of civilization, the historical context of this painting represents the struggle of ancient people to break free from dependency on nature – break free from Stone Age and into early civilizations. Their own hard work and survival skills enabled them to overcome elements of nature, overcome Fist of Gods, and become masters of their future. 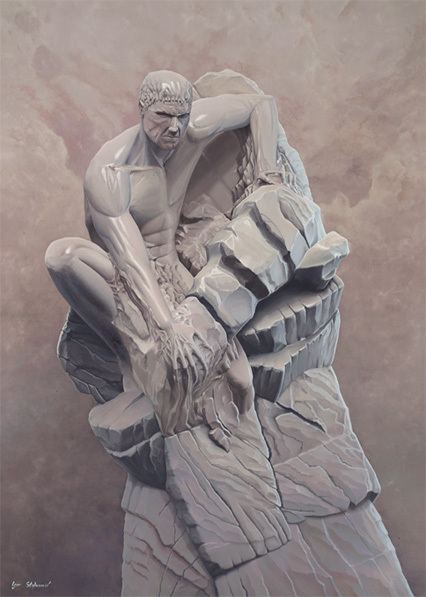 Classical Escape presents physical escape of human body from dependency on nature. Variations of yellow tone stand for the color of human skin – and also color of mud and stone from which we all originate. RENAISSANCE ESCAPE reflects central part of the journey. As you climb out of the pit and reach the surface, the excitement of success last for a while, but not too long. Ambition grows and you feel the need to keep climbing – but there are no more walls. So instead, you start climbing the social ladder, trying to move up in society. At this point you realize, that the nature of the struggle changes. All around are other people, which have climbed out of their own pits and are very ambitious – having the same goals as you. This is the moment of coming to big city, to new country, or simply out of college into first job and more competitive environment. For me, this was the moment of leaving Serbia and going to London to work on my first big Hollywood animated productions. And two years later, moving from London to Los Angeles, to work for DreamWorks. These new situations evoked a mixture of feelings that were eventually melted into Renaissance Escape. This second piece is dedicated to people around me: my friends and family who I had to leave behind; and to the other ones – direct competitors, cynical and judgemental ones. This painting is about climbing the ladder of success and its inevitable price. Historically, this painting is inspired by the age of Renaissance. It presents the escape of human soul and heart, waking up from medieval dogmas. During Renaissance great astronomers, geographical explorers and artists reshaped society and started to see world as it truly is – usually with great personal sacrifice and condemnation by that same society. One can not step into unknown, reach for life’s dreams and let go of what society dictates, without courage and heart. Therefore, Renaissance Escape presents spiritual escape of human soul from medieval dogmas. Red colors are metaphorical representation of human heart and blood. CUBIST ESCAPE represents the last chapter on the journey towards self realization. As you reach certain height on the social ladder, you slowly lose interest in comparing yourself to other people. You start thinking about who you really are and what you truly want out of life. Your mind is filled with thought about your dreams, and you begin the ultimate battle – against yourself – to define yourself from rough, basic ideas. You want to bring the best out of you and present it to the world. At the age of 31, I was at the peak of my animation career. Working for DreamWorks, at the heart of the movie industry in Hollywood, I have matured professionally and personally. I have completed my intellectual arc, and realized I want to tell this story – through these three paintings. It took me next two years to finish them. 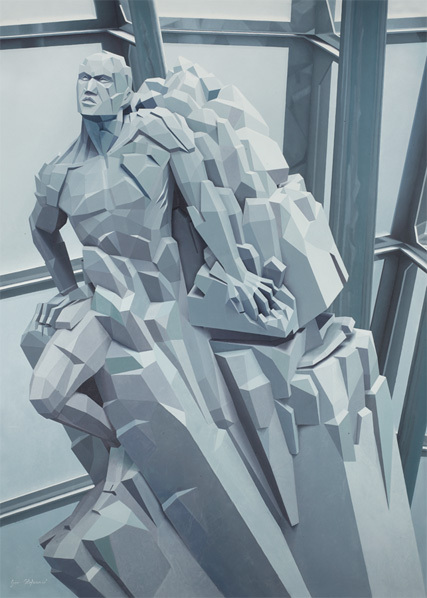 Historically, Cubist Escape is inspired by modern Spanish painters, Picasso and other cubists. It represents modern industrial and scientific age, age of intellectual analysis. It is the escape of human mind – it stands to represent the trite phrase “Thinking outside of the box” – which is why the painting is created by cubes. In this age of science, the idea of who we are crystallizes from vague presumptions from the earlier eras. The same concept is reflected in art – it becomes conceptual and symbolizes the idea, rather than just depicting a specific material scene. Cubist Escape presents intellectual escape of the human mind. The blue color of the painting represents the sky that we are trying to reach. 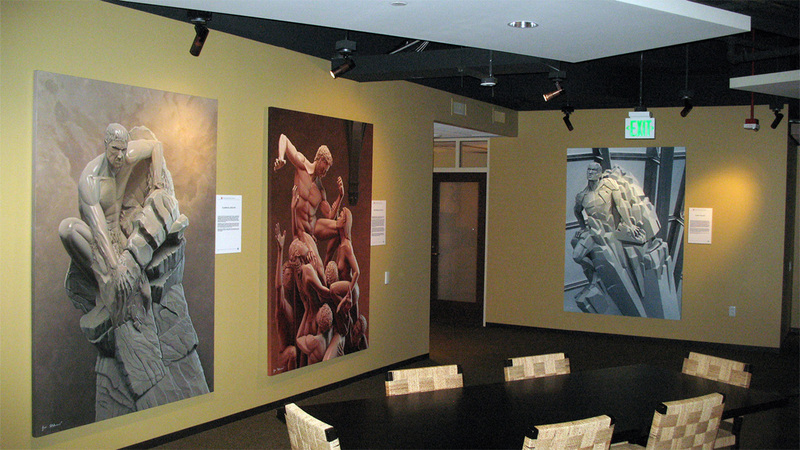 Escape Triptych together represents physical, spiritual and intellectual journey – both on the level of individual and on the level of civilization. These three aspects are painted in yellow, red and blue tones – the three primary colors in the color spectrum. In physics, when these three colors are combined, they form pure white light. In the same way, human Body, human Heart and human Mind form a complete human being. Escape Triptych is available in limited edition of reproductions. Please check the Editions page. The process of production that took 18 months is documented and compiled into a short video – from early rough sketches to finished full size paintings.